Get ready for the Fiesta! 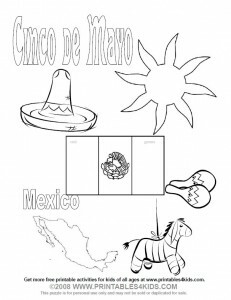 Print out our original coloring page for your Cinco de Mayo (Mexican Independence Day is actually in September) celebration and color the Mexican flag, a sombrero, maracas, a pinata and more! Click on the image above to view and print full size or download the Cinco de Mayo Coloring Page as a PDF. I like your worksheet-style coloring page. I just came across your site and noticed that you have Cinco de Mayo labeled as the Mexican Independence Day, which is not correct. Cinco de Mayo is the celebration of a battle won at Puebla. Mexican Independence Day is on September 16th. Just thought I would let you know. Thanks!